A checkerboard cake is a very pretty choice for any type of party or event. You can create these cakes in round, square, rectangular designs as well as more elaborate shapes. It is important to try the simpler shapes before attempting heart-shaped or oval designs. This pattern is almost one hundred percent dependent upon being able to cut the cakes neatly and accurately. Bake the cakes with the idea of having at least three layers to provide a clear checkered pattern and planning on four layers for best results. The cakes used should obviously be flavors that have contrasting colors such as vanilla and chocolate or lemon with strawberry. Obviously, a white chocolate cake and vanilla cake will not create a stunning clear pattern! 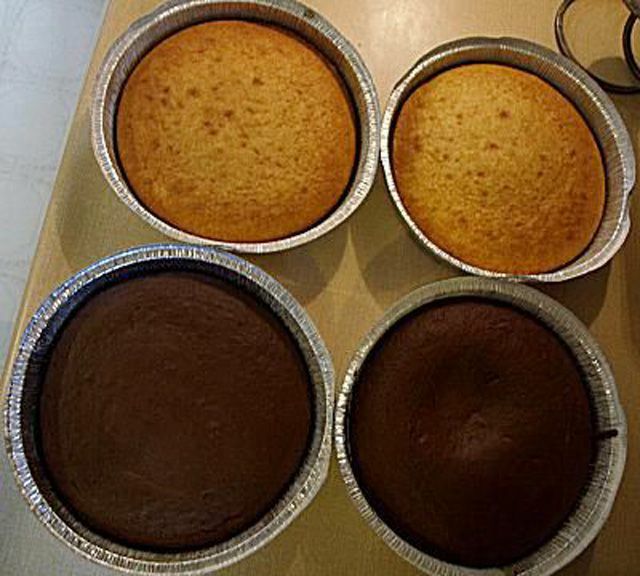 After the cakes are baked make sure they are chilled completely before attempting to cut and reassemble the design. A chilled cake will be firmer and less "crumby" and your finished product will be more of a success. When the cakes are completely chilled take them out of the pans and level the tops taking care to create similar heights on all the cakes. You will be combining the cakes so having the same height will be necessary for a clear design. Take an assortment of cutters in the same shape as the cake and place them on one of the cakes. You need to pick at least two or three cutters that can be evenly spaced on the cake and create rings that are not too thin. If the rings are too thin they will be impossible to move without breaking the cake and ruining the pattern. Use the cutters to cut rings in each cake spaced in an identical manner on all of them. If you do not have cutters you can use bowls or glasses to create the rings on a round cake. Place the largest bowl on the cake and carefully cut around the bowl with a very sharp knife pressing right down to the bottom. Then place the next smallest size on the cake centering it in the previously cut circle. Repeat until you have a center circle cut which is at least 2 inches across. To create a checkered pattern in a cake you need to make rings of alternating flavored cake stuck together with buttercream or some other favorite icing. After the rings are cut in all the cakes remove the inside rings in each cake in whatever order you think works best. You can start from the outside and work in or from the center and work out depending on your preference. There are benefits to either order. If you work inside out you will gain stability because you will be moving circles rather than fragile rings of cake. You will also run the risk of having the icing stick to the cakeboard and the circle breaking. Rings of cake break easily but can be put in place without smearing icing. It is also important to use a buttercream that spreads easily otherwise crumbs will get pulled off the rings and the design will be wrecked. As you place the different flavor rings in place you will be putting icing between each ring to glue them together. Don't spread the icing too thick or the rings will not fit. After the cakes are reassembled with the contrasting rings it is time to stack them into a cake. Put the first layer on your cake board and spread a thin layer of buttercream on the top of the layer. Stack the second layer on the first taking care to stack a layer that has opposite rings. So if the outside ring on the first layer is chocolate then the outside ring on the second layer should be vanilla. Repeat this process until the last layer is stacked on top. Crumb your cake with any leftover buttercream so the finishing icing will spread with no flaws. Chill the cake completely before applying finishing icing so that the different rings and layers stabilize. This type of cake pattern is a lovely surprise for guests and it certainly looks like it took a great deal more work than it actually does! It is also a wonderful way to combine flavors like coffee, hazelnut and chocolate in a unique manner.